It became easier to see the laser beam in the light place than before. 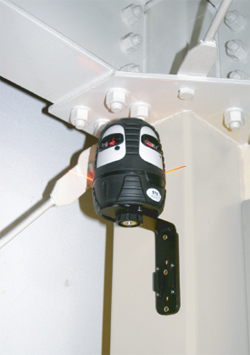 Using included original Detector, SS-50Z, it will be possible to detect laser beam in the light place where is usually difficut to see, up to maximum about 50m. 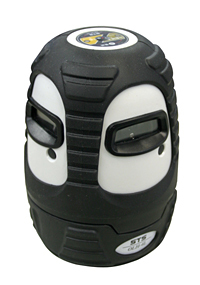 Water and Dustproof equivalent to IP54 protects the instrument in the harsh operational site. Even for users using this instrument indoor, Dustproof is neccessary. In Automatic Compensation Off Mode, even out of its Automatic Compensation Range（±５°）, you can project laser beam at your desirable angle. ※Horizontal operation is not available. ■L shape Wall Mount is included in the standard accessories. 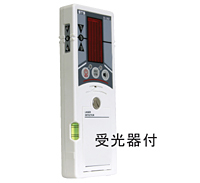 ※For Rechargeable Battery, SCL-42 is neccessary. ※It is impossible to use Recharger, SCL-42, alone. ※It cannot be used alone. Elevator Tripod for Laser is neccessary. 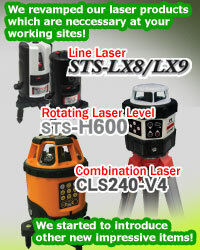 Slope Warning ○　When out of compensation range, all laser beam blink and it makes buzzer sound. Power Alkaline Dry Cell Battery　AA (LR6) x 4 pcs. Detector Available Please use included Detector,　SS-50Z.